Mississippi River Basin Gets A Grade Of D+ : The Two-Way A group that measures river basin health cited the poor condition of infrastructure such as locks and dams, among other things, on what it says is the world's fourth-largest watershed. A steamboat drifts along the Mississippi River in New Orleans. 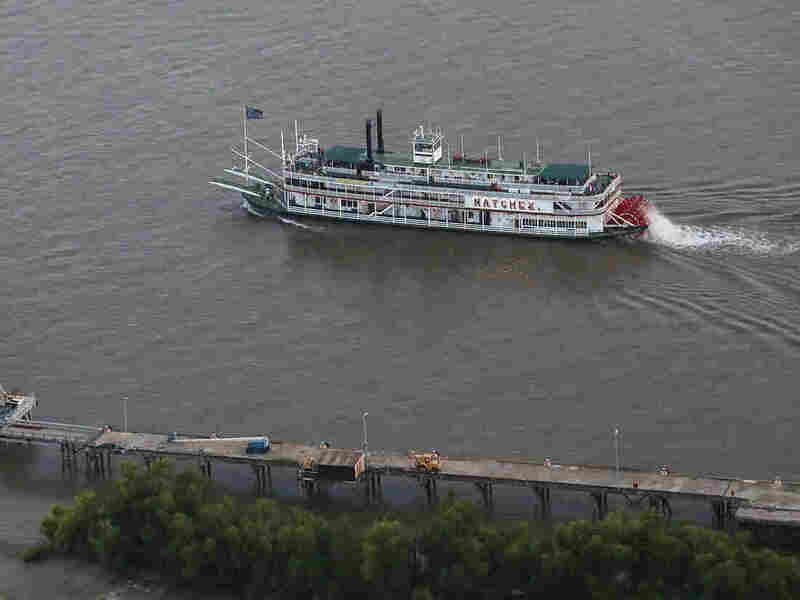 A group called America's Watershed Initiative says "funding for infrastructure maintenance means that multiple failures may be imminent" for the lower Mississippi River basin. The Mississippi River basin has gotten a report card from a group that monitors watershed health and economic impact — and the grade is D+. The organization, America's Watershed Initiative, cited the poor condition of infrastructure such as locks and dams, and a lack of funding that could lead to water security issues. The Mississippi River watershed is the fourth-largest in the world, according to the group. It is made up of five river basins that flow across 31 states. It falls short in its goal of serving as the nation's most valuable water passage, according to the report, which notes that the watershed transports $54 billion of agricultural products annually. "Critical components for locks and dams are in relatively poor condition across the Watershed, and a dangerous lack of funding for infrastructure maintenance means that multiple failures may be imminent. River transportation currently functions with some delays, but as these systems continue to deteriorate, significant failures could be expected which would result in severe, economic, public safety and water security problems." Maria Altman of St. Louis Public Radio spoke with Heath Kelsey of the University of Maryland's Center for Environmental Science, who was the project lead for the report. Kelsey says up to 97 percent of locks and dams are in good condition, "but it's that 2 or 3 percent in failing or near-failing condition that is of concern. That 2 or 3 percent is a really big deal." One failed lock, he tells Altman, can tie up the rest of the system. America's Watershed Initiative arrived at the D+ after measuring six main categories: ecosystems, water supply, transportation, economy, recreation, and flood control and risk reduction. The river basin received moderate marks for providing "robust nature based recreational activities," but the group said "much more needs to be done to support current and emerging recreational opportunities through effective management of natural resources that support recreation." Sustaining and increasing the basin's capacity through rehabilitation, repairs and innovation, it says, is "necessary in order to maintain a competitive economy." The website for America's Watershed Initiative says the organization brings together hundreds of business, science and government organizations to identify and recommend areas of improvement to water quality, safety and health of America's heartland rivers — including the Mississippi River and the more than 250 rivers that eventually flow into it.